Viewing 24 of 153 items. Celebrate the season with our foil stamped Christmas photo cards with a gold foil frame accent. Matching blank envelopes are included. Photo cards come with fully printed card back. Size of photo.. Celebrate the season with our foil stamped Christmas photo cards with a gold foil Joy Snowflake design. Matching blank envelopes are included. Photo cards come with fully printed card back. Size of.. Send your holiday wishes to friends and family with this set of beautiful foil stamped foldover holiday cards. Inside imprint will be flat printed in ink color and typestyle of your choice. Size.. Celebrate the season with our foil stamped holiday photo cards. Matching blank envelopes are included. 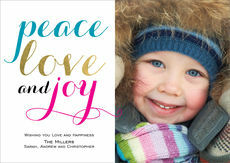 Photo cards come printed with white peace love and joy on card back as shown on sample. Size of.. Celebrate the season with our foil stamped holiday photo cards. Matching blank envelopes are included. Photo cards come with a fully designed card back as shown. Size of photo cards are 7.75" x.. 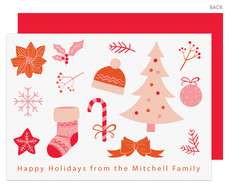 Send your holiday wishes to friends and family with this set of whimsical flat holiday cards. Flat printed in ink color as shown with typestyle of your choice. Size 7" x 5". Matching blank.. Send your holiday wishes to friends and family with this set of beautiful foldover holiday cards. 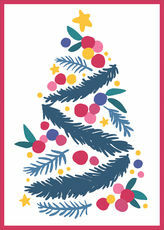 The Christmas Tree design is accented with gold foil stamped accents. 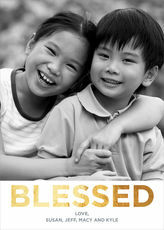 Inside imprint will be flat..
Set of stylish photo cards featuring our Blessed foil design. Your choice of foil design color. Blank white envelopes included. Sized 5" x 7". Optional printed return address and envelope linings.. Send your holiday greetings to friends and family with this set of beautiful contemporary Christmas tree foldover holiday cards. 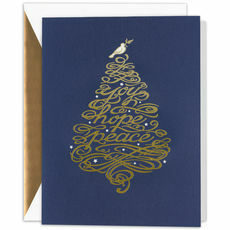 Tree design is foil stamped with wording Joy, Hope and Peace within.. Send your holiday wishes to friends and family with this set of beautiful foil stamped flat holiday cards. Your choice of foil color for wording "Merry Christmas". Your signature lines will be flat.. The season just would not be complete without sending out Holiday Photo Cards. It has become a tradition to open the mailbox and find a greeting from friends and loved ones. This set of foil pressed.. Send your holiday wishes to friends and family with this set of beautiful foil stamped foldover holiday cards. Your choice of foil color for outside wording "Holiday Wishes". Inside imprint.. Celebrate the season with our Happy Holidays foil stamped holiday photo cards. Matching blank envelopes are included. Photo cards come with a fully designed card back as shown. Size of photo cards are.. Send your holiday wishes to friends and family with this classic plaid set of beautiful foil stamped foldover holiday cards. Gold foil color will be used for outside wording "Happy.. Celebrate the season with our foil stamped Christmas photo cards with a gold foil Happy Holidays Starburst design. Matching blank envelopes are included. Photo cards come with a fully designed card.. Send your holiday wishes to friends and family with this modern set of beautiful foil stamped foldover holiday cards. Tree design includes gold foil stamped trees. Fat printed in ink color and.. Send your holiday wishes to friends and family with this modern and trendy set of foil stamped foldover holiday cards. Your choice of foil color for Merry Christmas word and design on neck of the..
Shop unique foil holiday cards and add shimmer and shine to your holiday with our foil stamped photo cards. We add a special touch of elegance with gorgeous on-trend foil accents of your choice of foil frames, damask patterns, confetti designs and other wonderful accents. Our quality foil pressed cards are printed with a unique process that presses real foil into the paper stock. Foil comes in many colors including gold, silver, rose gold, blue, red, green, purple and more. This year, share your love for the season with your friends and family with something that adds a touch of shine. Choose from a wide variety of Christmas cards and photo holiday cards that have a foil accent and you will certainly impress them with your style. You can be confident that your order will be printed with care. Each order is personally reviewed by our experienced production team which provides care and quality. Of course, free envelopes are included with each order with the option for return addresses and envelope linings. If envelope linings are selected, they are securely inserted and adhered to each envelope. 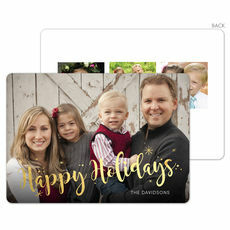 Many holiday cards are available in the shape of your choice. Card shapes are available at no extra charge and include medallion, rounded corners, scalloped edges and rectangle. You will love the beautiful finishing touches that add extra charm to your holiday cards. Make this holiday merry and bright with the shine of real foil on your cards this season!